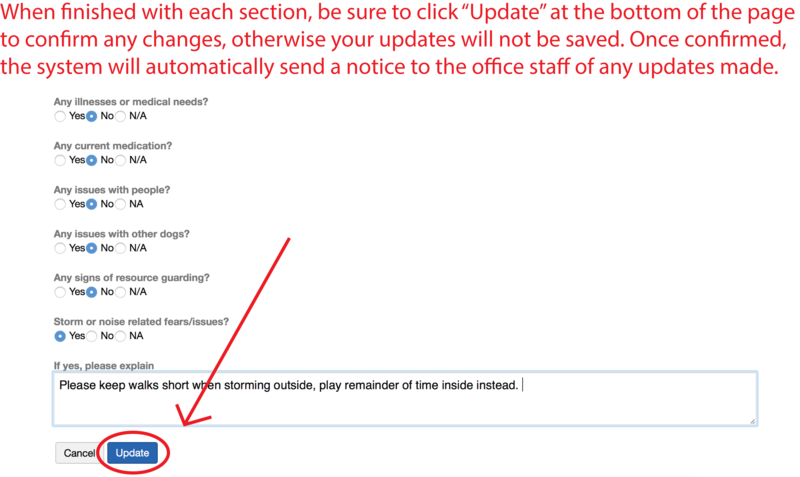 Below you will find useful information, step by step instructions and answers to your top asked questions. If you need additional assistance, please do not hestitate to reach out to us! We have office staff ready to assist Monday – Friday, 8am-5pm! *Reminder: We require a minimum of 24 hours for all petsits. If you know someone who needs their dog cared for 3 or more times per week regularly, we’d love to hear from them! 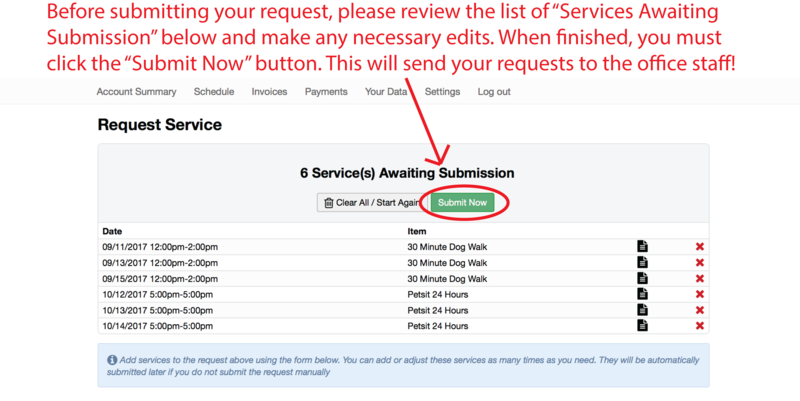 If they become a client of ours, we will credit your account $50 as a thank you after their first month of service! Just remember to have them mention your name when they sign up! If you have (1) scheduled dog walk per day, we require a 2 hour timeframe for the walker to arrive in. If you have (2) scheduled dog walks per day, we require a 1 hour timeframe for the walker to arrive in. 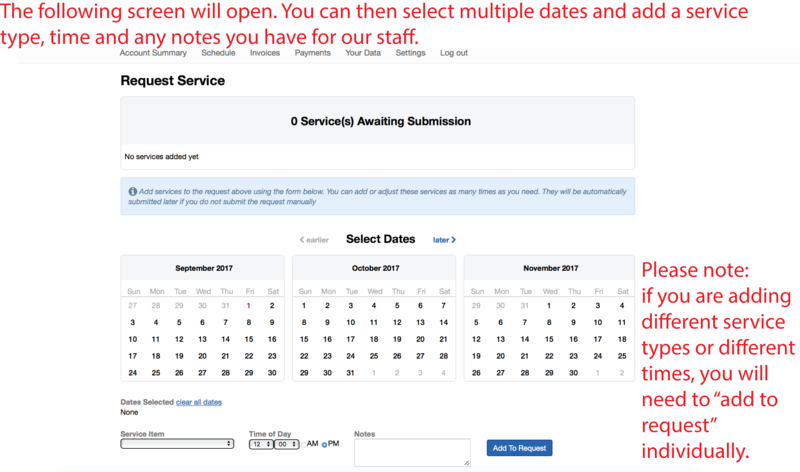 *If you are unable to select your preferred timeframe, please leave notes for our office staff in your request as to the exact timeframe you wish to schedule. Sitters typically arrive consistently at the same time of day (morning/afternoon/evening) but we ask for a 8am-6pm time window for cat visits unless medication is needed. 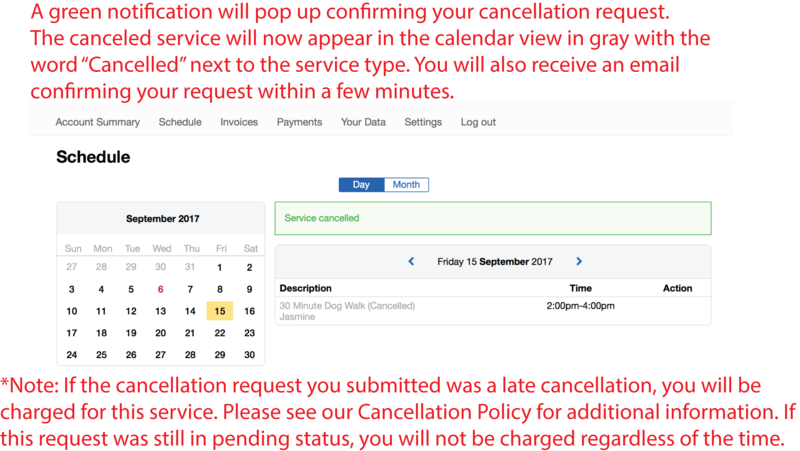 You must submit your cancellation request by 5pm the day before a scheduled service or it will be charged in full. 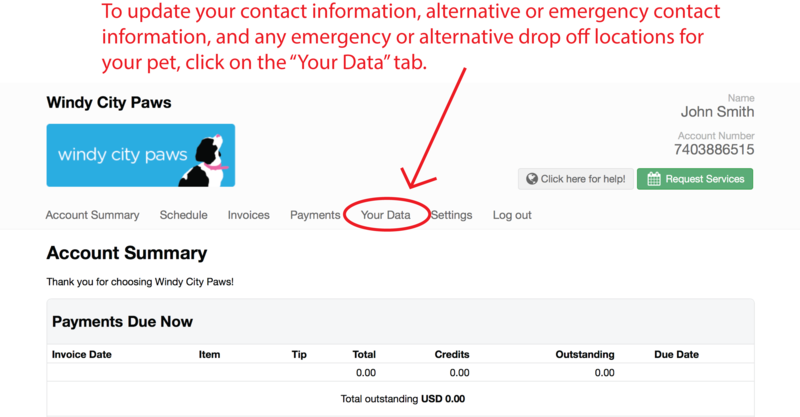 You must submit your cancellation request by 5pm (2) days before the first scheduled day or you will be charged for (2) full petsit days. 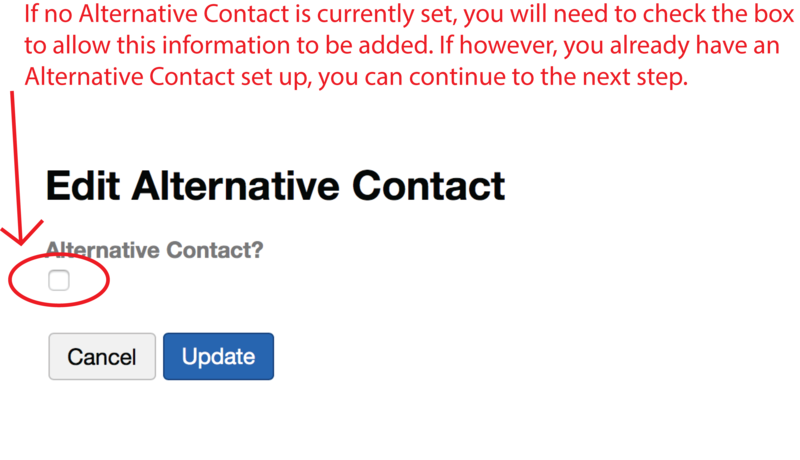 *Cancellation requests submitted after the deadlines described above are considered “late cancellations,” and will be referred to as such in email communication. 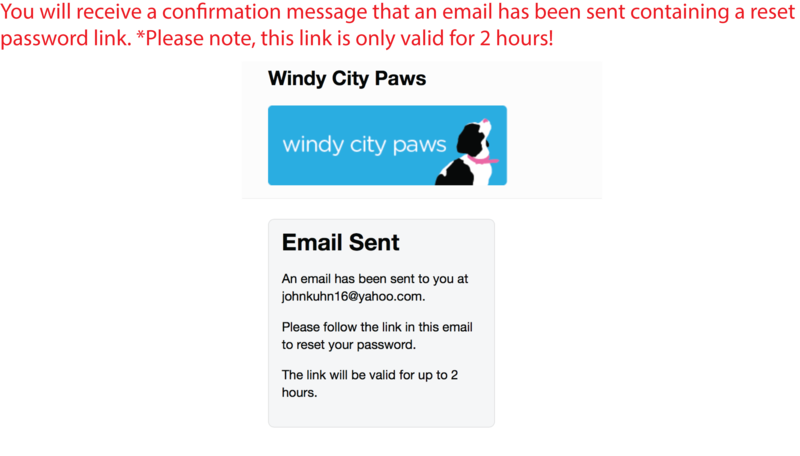 If in the event your regular dog walker is unable to walk your dog due to illness or planned time off, it is Windy City Paws’ policy to seamlessly assign another walker on staff to walk your dog that day. 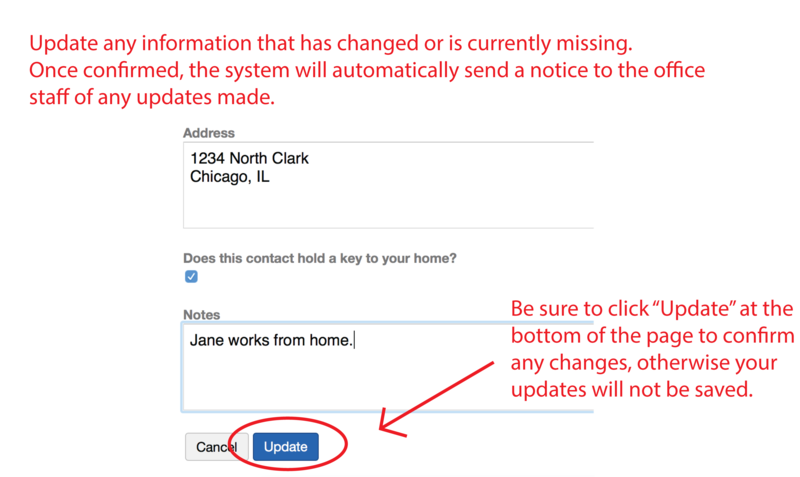 It is not standard protocol for us to notify you proactively of the change in walker unless your dog has special needs. 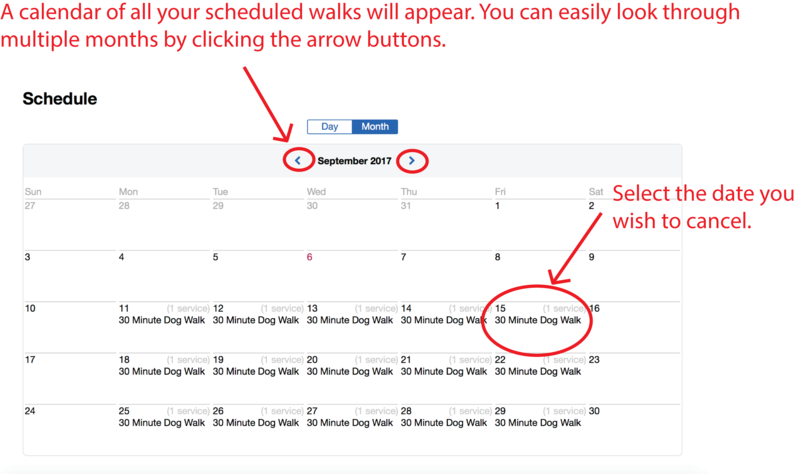 You can always view the dog walker scheduled to walk your dog in the online scheduling system. 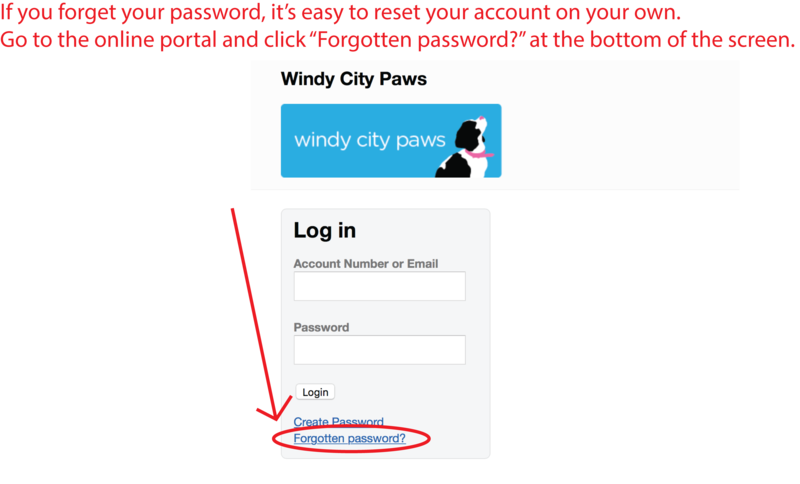 Windy City Paws will not have regularly scheduled services on the following Holidays. 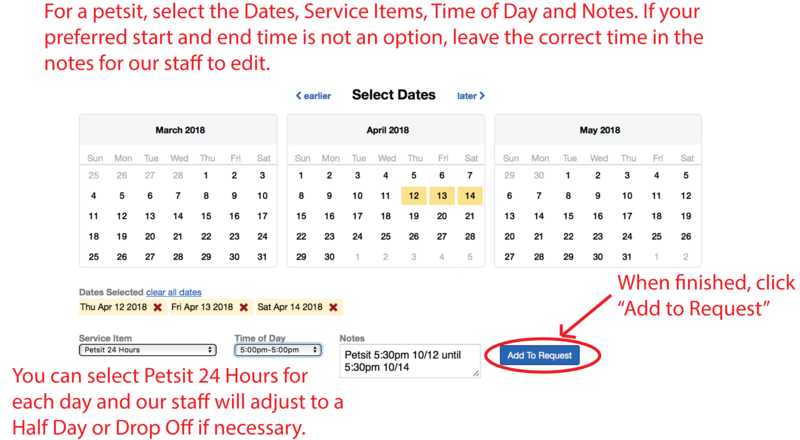 If you need service on any of the following days, you must request the service in advance. Our holiday rates will apply. 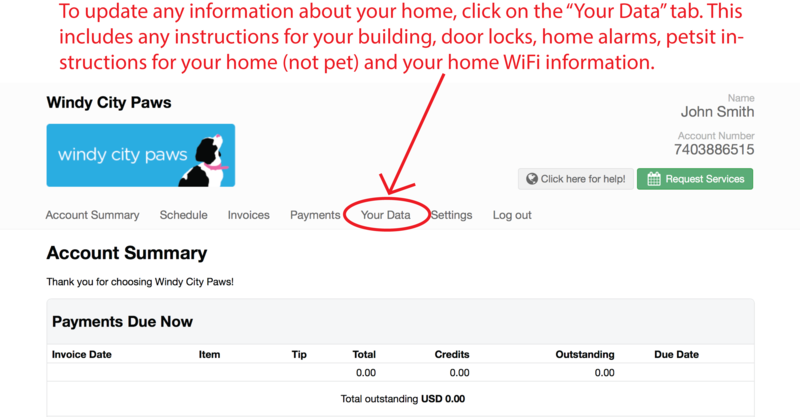 WHEREAS , Client desires to retain WCP for the performance of certain dog walking and in home pet care services for Client’s Pets (hereinafter “Services”). 1. Information About Client and Client’s Pet(s) must be keep current by Client in Pet Sitter Plus. *A Holiday includes any Illinois State or United States Federal Holiday observed by WCP (as listed at www.windycitypaws.com ). Only a 30 minute dog walk, cat visit or petsit can be scheduled on these days. 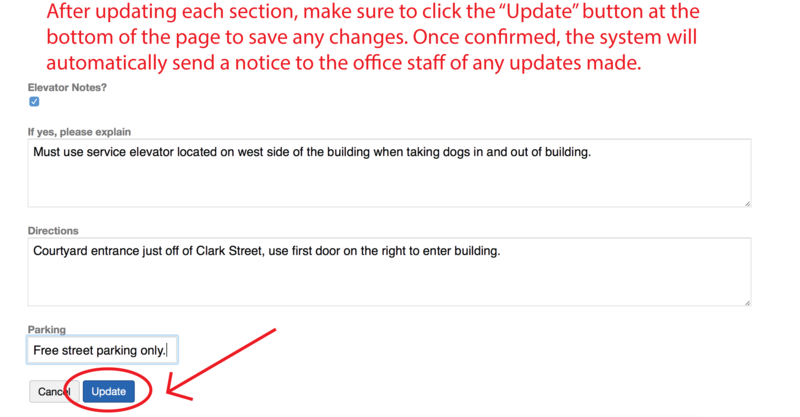 ** If during any scheduled Dog Run there is inclement weather, Walker may, in Walker’s sole discretion, deem the weather unsafe to perform a Dog Run. 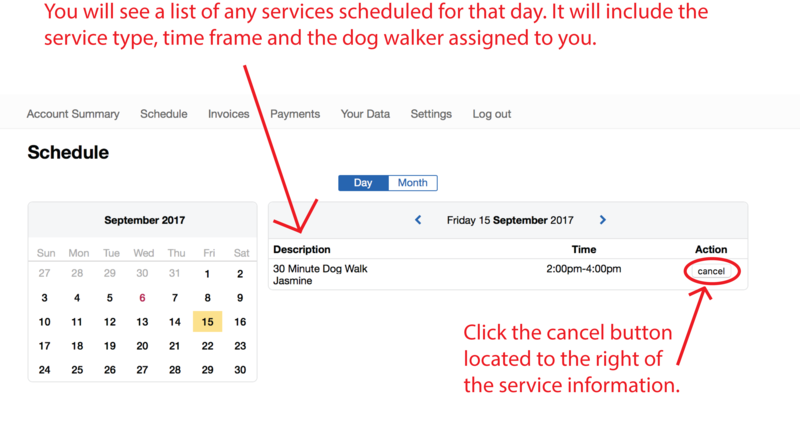 In such instance, Walker may perform a 30 Minute Dog Walk during the scheduled time and bill accordingly. Note: There is an additional fee for each additional dog during a 24 Hour Petsit and/or any combination of small animals (i.e., cat, bird, small reptiles). WCP reserves the right to characterize an animal large and add an additional fee per such animal. An additional fee will be charged for each additional dog during a Half Day Petsit and/or any combination of small animals (i.e., cat, bird, small reptiles). WCP reserves the right to characterize an animal large and add an additional fee per such animal. A. Dates that Client needs Services: Client shall notify WCP at least 48 hours prior to when Services are needed. 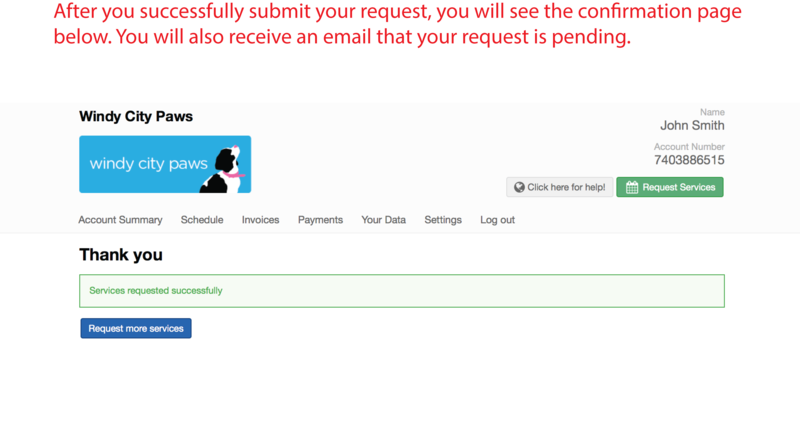 Client shall notify WCP in accordance with WCP’s standard Services scheduling procedures. No Service is scheduled until first confirmed by WCP via email communication. 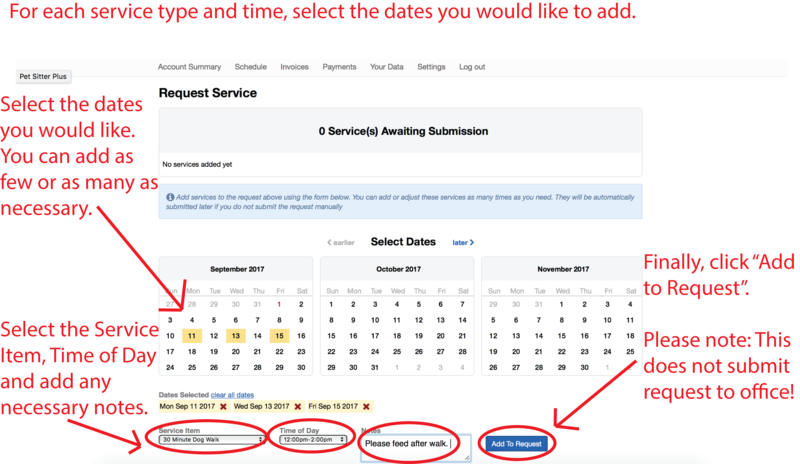 If Services are requested less than 48 hours prior to any requested service, WCP will attempt to accommodate Client’s request and timely notify Client if unable to do so. B. On the 5 th day of the calendar month immediately following the performance of any Services, Client agrees to pay to WCP for all Services rendered during the immediately preceding month. Payment shall be deemed made when, and only when, its receipt has been verified by WCP. Accordingly, Client expressly authorizes WCP to charge Client’s credit card (to be held on file), on the 5 th day of every Calendar month, all monies owed WCP for Services rendered during the immediately preceding calendar month. Client further agrees to maintain an active credit card, on file, at all times. 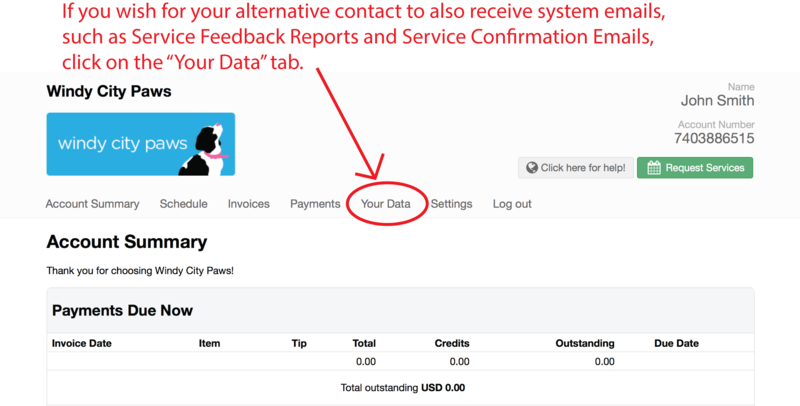 For any denied transaction resulting from WCP’s inability to charge Client’s credit card, Client shall immediately pay WCP, upon receiving notice from WCP, the balanced owed, including a 10% late fee. C. WCP reserves the right to increase the price for any Services at any time. 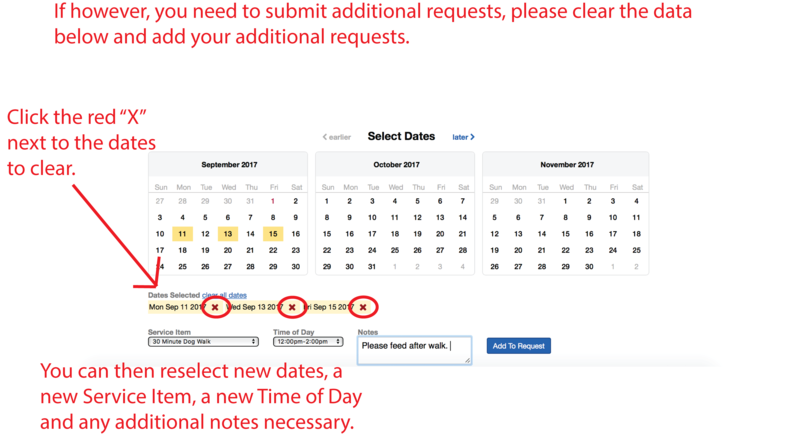 Prior to any increase, WCP shall provide Client with at least thirty (30) calendar day notice, via email communication. 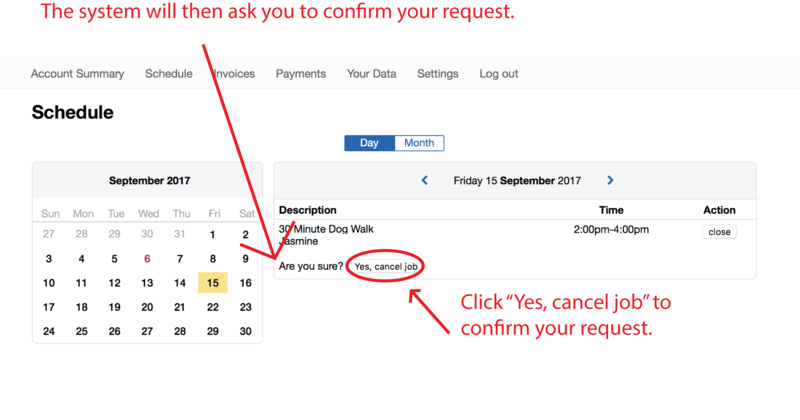 D. Client understands and agrees that if Client cancels a scheduled Dog Walking or Cat Visit Service after 5:00 p.m. the day before a scheduled Service start time, WCP may charge Client for the full amount of the Service. 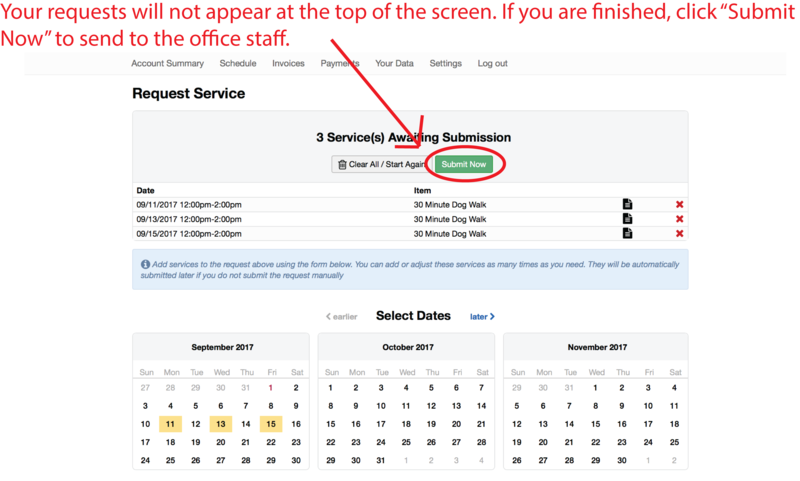 Client understands and agrees that if Client cancels a scheduled Petsit after 5:00 p.m. 2 days before a scheduled Service start time, WCP may charge Client for the full amount of the Service. 3. WCP does not warrant or guarantee that a particular WCP walker (“Walker”) will be available for any particular scheduled Dog Walk. Additionally, should a pre-arranged Walker of WCP become ill, or otherwise unavailable, WCP may substitute the Walker assigned with another Walker. Should a WCP Walker (or any replacement) be unavailable during a scheduled Petsit or Cat Visit, and in other certain instances where performance of Petsitting Services by WCP is impractical, WCP may cancel any scheduled Petsit or Cat Visit, at any time, prior to the Petsitting Services having been performed. 4. 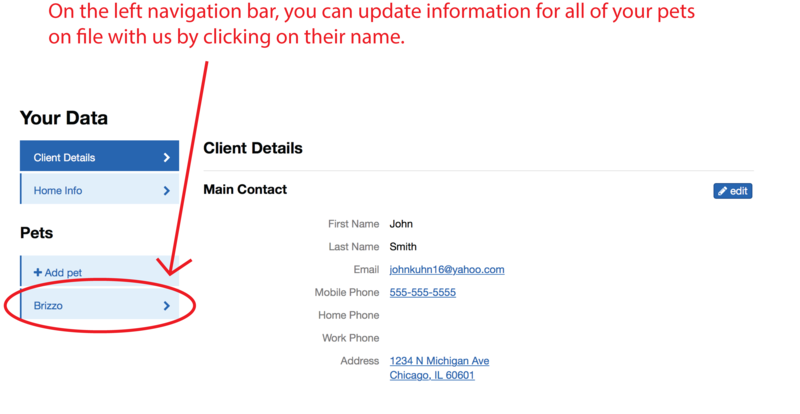 Client agrees that all email or other correspondences sent to WCP by Client (e.g., last minute additions or cancellations) must be acknowledged by WCP by email communication. 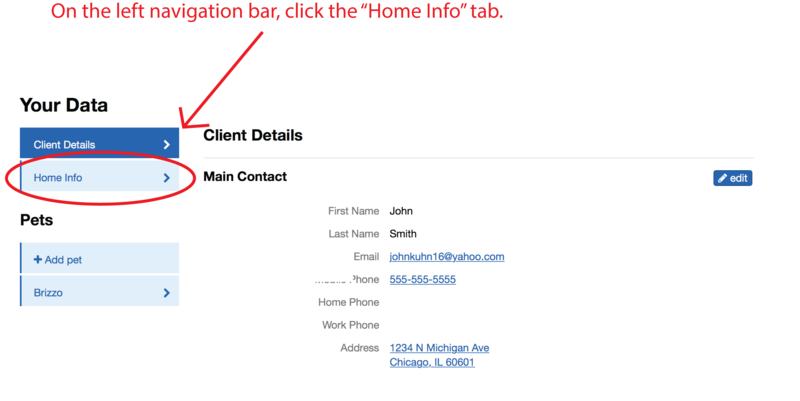 If Client does not receive a confirmation of receipt, it is Client’s responsibility to ensure that the message has been received. 5. Client is responsible for supplying the necessary, safe equipment and supplies needed for care of Pets, including but not limited to a sturdy, well-fit collar, leash and harness, firmly affixed vaccination tags, poop bags, food (if applicable), cleaning supplies and medicines (if applicable) prior to each Service. Client authorizes any purchases reasonably deemed necessary by WCP and/or Walker for the satisfactory performance of Walker’s duties. Client agrees to be responsible for the payment of such items, as well as service fees for obtaining items, whereby payment shall be made in a method consistent with Section 2(B) of this Agreement. Client agrees to provide a suitable towel to use in the cleaning of Client’s Pets when necessary. This towel will be left by the front door of Client’s house or apartment prior to each scheduled Service. Client understands that WCP’s Walkers have a limited amount of time to spend cleaning Pets on muddy days, and unless previously agreed to by Client and WCP, Client’s Pets will be not be bathed under any circumstances. 6. Client agrees to secure home prior to leaving the premises. WCP shall not be held liable for any loss or damage in the event a burglary or other crime that should occur during any scheduled Services, unless said loss or damage is a direct and proximate result of WCP’s or Walker’s recklessness. 7. At the time that Petsitting Services of WCP is reserved, Client will notify WCP of everyone who has been granted access to the home during the service period. Any individual not previously granted access by Client and/or access has not been communicated to WCP, shall be refused entrance by WCP into Client’s home. 8. WCP will not service a home with “visiting” pets or animals that do not belong to the Client without 48 hours’ notice to WCP prior to any scheduled Service. 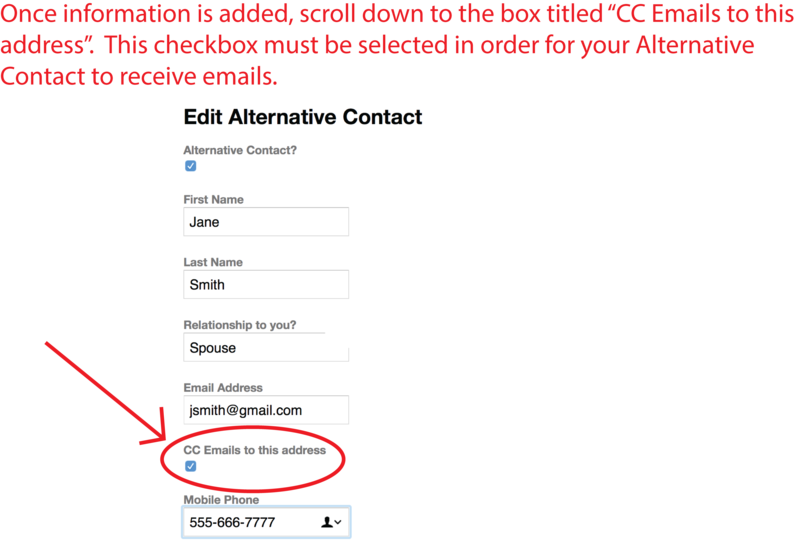 Notice shall be provided via email communication to WCP, and shall be deemed received only upon receipt of a reply email. 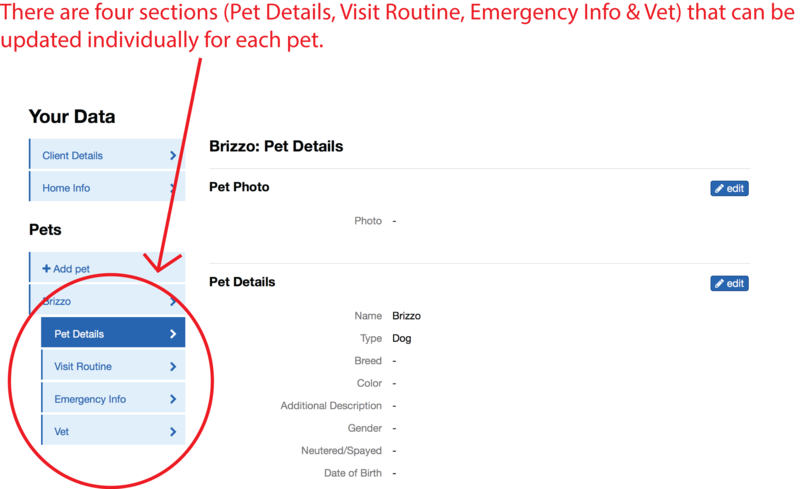 Where Client does provide timely notice, Client shall also provide a full description of the pet and all available notes and instructions for the care of the visiting pet. Client agrees to indemnify and hold WCP harmless from all liability relating to, and arising out of the care of a visiting pet. 9. Client is responsible for pet-proofing Client’s home and yard, and the security fence, gates and latches, as applicable. WCP is not responsible for the safety of any pets and will also not be liable for the death, injury, disappearance, or legal consequences of any pet with unsupervised access to the outdoors. 10. Walkers are employees of WCP, and not partners or joint venturers of WCP. 11. 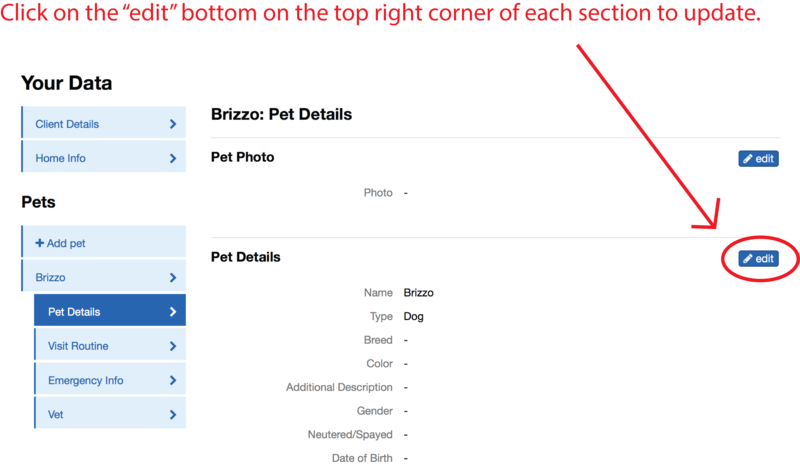 WCP and Walker may use its sole discretion to stop and end a Service at any time that it is reasonably believed by WCP and/or Walker that Client’s Pets pose a danger to the safety or health of itself, other pets, other people, Walker or any property. If reasonable concerns prevent Walker from continuing to care for Client’s Pets, Client authorizes Client’s Pets to be immediately returned to Client’s home, or taken to a previously arranged locale (as identified in Section 1(G) of this Agreement), or placed in a kennel or nearest animal care facility, as appropriate, should a previously arranged locale not have been identified at time of execution of this Agreement, unavailable or otherwise not reasonable or practical (at WCP’s sole determination), at time of placing. All subsequent charges, including but not limited to transportation, kenneling, tranquilizing, treating, accessing, and liability, are to be Client’s sole responsibility. A. Client shall deliver 2 keys to WCP for entrance into Client’s home. One key shall remain with Walker and the second shall be stored at WCP’s office, and used as a back-up or for emergency purposes (e.g. Walker inadvertently locks himself/herself out of Client’s home). All keys will be promptly returned to Client upon request or upon termination or expiration of this Agreement. 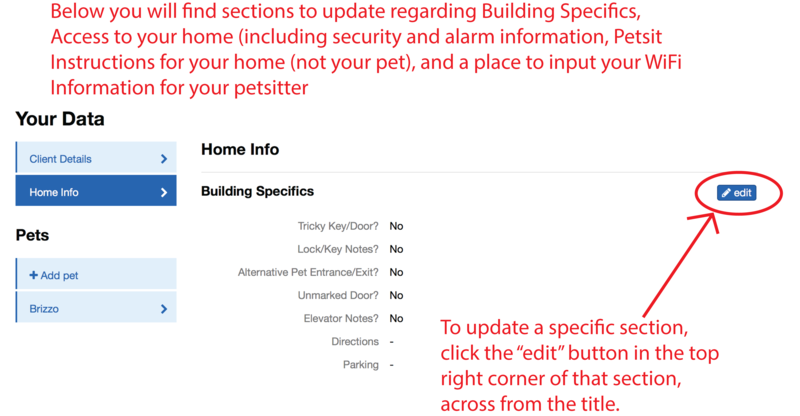 Additionally, should a key be lost or misplaced by WCP, WCP agrees to reimburse Client for the replacement cost of a new key, up to $200.00. B. If Client lives in a condominium or apartment building with a doorman stationed at the entrance of the condominium or apartment building, Client may instead leave a key for entrance into Client’s home in the custody of the doorman. Client expressly acknowledges that if Client fails to leave a key in the custody of a doorman or Client fails to authorize WCP or Walker to entitlement of possession of a key in a doorman’s custody, resulting in WCP’s inability to gain entrance into Client’s home and perform a scheduled Service, Client shall be responsible for full payment of the scheduled Service. 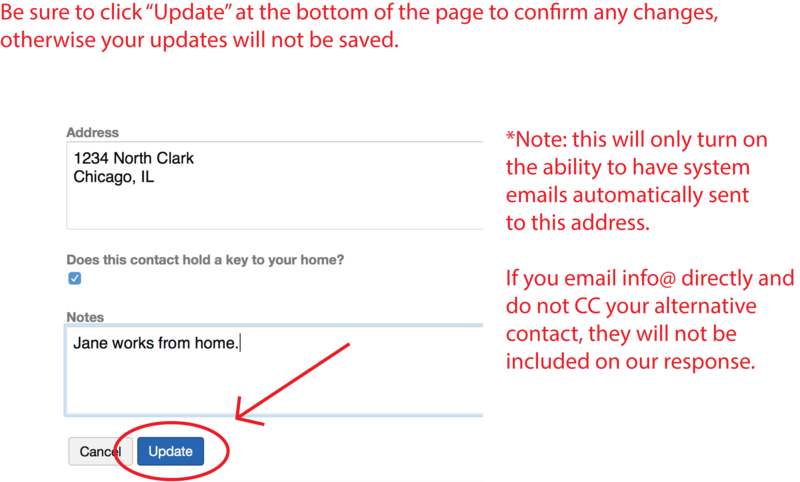 C. If no Services have been scheduled for a period of 6 consecutive months, WCP shall email Client at the last email address on file inquiring into whether Client would like the keys returned or discarded. If Client does not respond within 2 weeks, WCP shall mail the keys to Client’s last address on file, and Client hereby releases WCP from any further responsibility or liability pertaining to the keys. 13. WCP, its employees and agents, and Walker are expressly authorized herein to enter Client’s home for Services. WCP is not responsible for damage to the property of Client or to Client’s home, which includes, but is not limited to leaks, electrical problems, and acts of nature. 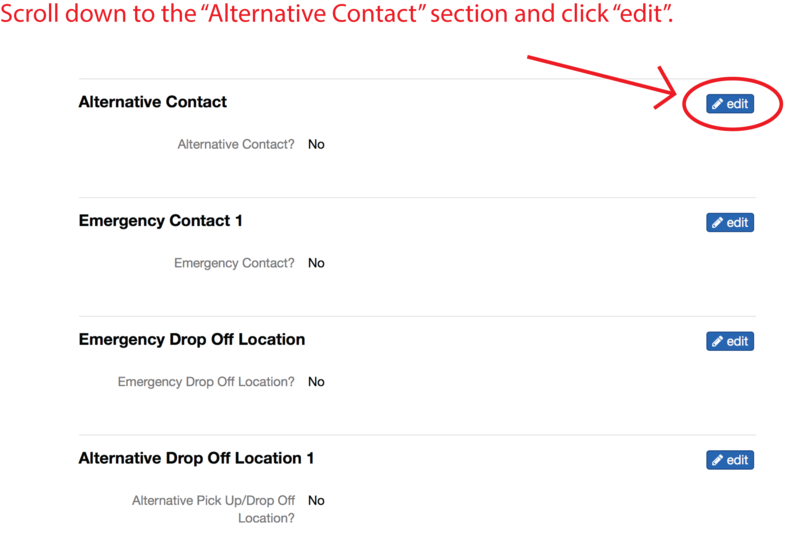 In these situations, WCP and/or Walker will attempt to contact Client and then the emergency contact before making a decision on how to deal with a problem. All repairs and related fees (including special service emergency service time fees) will be paid by Client or fully reimbursed to WCP and/or Walker. WCP and Walker are not responsible for the security of Client’s home or loss if other individuals have access to Client’s home or if the home is not properly secured. WCP shall not be held liable for any loss or damage in the event a burglary or other crime that should occur during any scheduled Service, unless said loss or damage is a direct and proximate result of WCP’s or Walker’s recklessness. Client agrees to secure Client’s home prior to leaving the premises. 14. Client will be responsible for all medical expenses and damages resulting from any injury to Walker, or other persons, by Client’s Pets. Client hereby agrees to indemnify, hold harmless, and defend WCP and Walker in the event of a claim by any person injured by Client’s Pets or any visiting pets. Client further releases WCP from all liability to Client for any loss or damage to property (including, but not limited to Pets and visiting pets), physical injury or death (including, but not limited to Pets), whether caused by WCP and/or Walker or otherwise that results, directly or indirectly from WCP and/or Walker’s care giving of a Pet or visiting pet at Client’s home during the performance of Services, unless said loss, damage or injury is a direct and proximate result of WCP’s or Walker’s recklessness. Client further agrees to indemnify, save and hold WCP harmless from any loss, liability, attorneys’ fees, damage, or costs that WCP may incur, or that may arise out of, or relate to WCP’s performance of Services, whether caused by the negligence of WCP and Walker or otherwise, and Client does hereby assume the risk of any such loss or damage, unless said loss or liability is a direct and proximate result of WCP’s or Walker’s recklessness. 15. This Agreement shall cover any and all Services scheduled between Client and WCP. This Agreement shall expire twelve months following the last scheduled Service by Client or by the mutual agreement by the parties. The obligations of Client in this Agreement shall survive expiration or termination of this Agreement. Furthermore, to the extent Client owes any amounts to WCP in relation to this Agreement, the expiration or termination of this Agreement will not release or waive WCP’s rights or remedies regarding sums due and owing. 16. The invalidity of any portion of this Agreement will not and shall not be deemed to affect the validity of any other provision. If any provision of this Agreement is held to be invalid, the parties agree that the remaining provisions shall be deemed to be in full force and effect as if they had been executed by both parties subsequent to the expungement of the invalid provision. 17. The failure of either party to this Agreement to insist upon the performance of any of the terms and conditions of this Agreement, or the waiver of any breach of any of the terms and conditions of this Agreement, shall not be construed as subsequently waiving any such terms and conditions, but the same shall continue and remain in full force and effect as if no such forbearance or waiver had occurred. 18. Any notice provided for or concerning this Agreement shall be in writing and shall be deemed sufficiently given when sent by certified or registered mail if sent to the respective address of each party as set forth in the introductory paragraph of this Agreement, or by email communication as provided herein. 19. This Agreement shall be governed by, construed, and enforced in accordance with the laws of the State of Illinois. Any dispute under this Agreement shall be required to be resolved by binding arbitration of the parties hereto. If the parties cannot agree on an arbitrator, each party shall select one arbitrator and both arbitrators shall then select a third. The third arbitrator so selected shall arbitrate said dispute. The arbitration shall be governed by the rules of the American Arbitration Association then in force and effect. 20. This Agreement shall constitute the entire agreement between the parties and any prior understanding or representation of any kind preceding the date of this Agreement shall not be binding upon either party except to the extent incorporated in this Agreement. Any modification of this Agreement or additional obligation assumed by either party in connection with this Agreement shall be binding only if placed in writing and signed by each party or an authorized representative of each party. 21. The rights of each party under this Agreement are personal to that party and may not be assigned or transferred to any other person, firm, corporation, or other entity without the prior, express, and written consent of the other party. 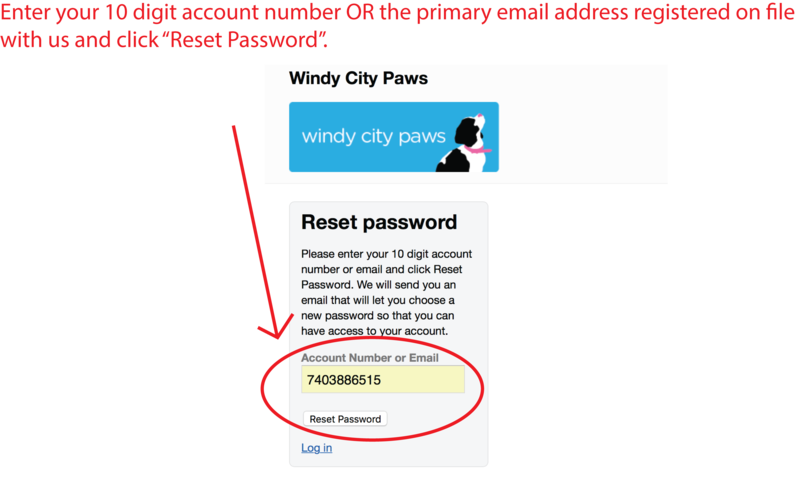 To Whom It May Concern: Windy City Paws Inc., hereafter referred to as Pet Care Provider, is the present Pet Care Provider for our pet. We hereby authorize and voluntarily consent to having Pet Care Provider arrange, direct, sign for and consent to any and all routine or emergency medical care and treatment necessary to preserve the health of our pet. Information is set forth below. Client acknowledges that he/she is responsible for all reasonable charges in connection with the care and treatment rendered and acknowledges that no guarantees have been made as to the effect of such treatment rendered. Client acknowledges that he/she has read, understands and agrees to all of the above.